In Minnesota, the Gravel Chub (Erimystax x-punctatus), also known as the Spotted Chub, reaches its northern limit in the Mississippi River drainage. In Minnesota, it is restricted to the Root and Upper Iowa rivers (Fillmore, Houston, and Olmsted counties). The specialized habitat of this species is at risk of degradation through siltation from sediment loading (Hatch et al. in preparation). In 1984, when the Gravel Chub was initially designated a special concern species, information on distribution, abundance, preferred habitats, and life history was limited. In 2013, following the completion and analyses of targeted surveys, the status of the Gravel Chub was elevated to threatened. A medium-sized minnow, the Gravel Chub is usually less than 10 cm (3.9 in.) long with a prominent barbel at the end of the maxillary (bone of the upper jaw). Its pointed snout extends slightly beyond the upper jaw. The body has a faint lateral stripe, and sides are marked with small X-shaped spots (Eddy and Underhill 1974). Large creeks and small rivers are the preferred habitat of the Gravel Chub. It is found in riffles over fine gravel and pea-sized limestone gravel in clear to slightly turbid waters. Little is known about Gravel Chub life history. 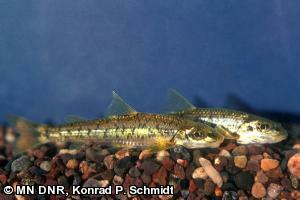 Indications are that spawning occurs sometime in May in Minnesota, possibly into early June (Hatch et al. in preparation). Spawning takes place adjacent to gravel bars, probably stimulated by rising water levels following heavy rains (Harris 1986). The Gravel Chub probes bottom crevices with its barbeled snout in search of food. Diet likely includes plant matter, diatoms, gastropods, and miscellaneous aquatic insects (Hatch et al. in preparation). Gravel chubs require permanent flow and silt-free riffles. Sediment loading in the lower Mississippi River drainage in southeastern Minnesota and the continued interference with flow regimes puts this species at great risk. Even though there is no historical evidence the species was present in the Minnesota reach of the Upper Iowa River (Mower County), reintroductions should be considered to establish a population upstream of the Lidtke Mill Dam at Lime Springs, Iowa. Gravel chubs have been collected in the tailwaters of the structure, which was built in 1857 and functions as a total fish barrier. There are records from the Cedar River in Mitchell County, Iowa, near the Minnesota state line (Harlan and Speaker 1987; Iowa BioNet 2016). Future surveys are recommended for the Cedar River (Mower County), downstream of Austin, Minnesota. Surveys by the Minnesota DNR in 1992-2000 (Schmidt 2000) and Minnesota PCA in 2004 recorded spotty distribution of this species in Fillmore and Olmsted counties. The recent inception of Minnesota’s Clean Water Legacy Program will eventually yield benefits to Gravel Chub habitats through nutrient and sediment load reductions. Harlan, J. R., and E. B. Speaker. 1987. Iowa fish and fishing. Literary Licensing, LLC, Whitefish, Montana. 278 pp. Harris, J. L. 1986. Systematics, distribution, and biology of fishes currently allocated to Erimystax (Jordan), a subgenus of Hypbopsis (Cyprinidae). Ph. D. Dissertation, University of Tennessee, Knoxville, Tennessee. 335 pp. NatureServe. 2015. NatureServe Explorer: an online encyclopedia of life [web application]. Version 7.1. NatureServe, Arlington, Virginia. <http://www.natureserve.org/explorer>. Accessed 26 April 2016.